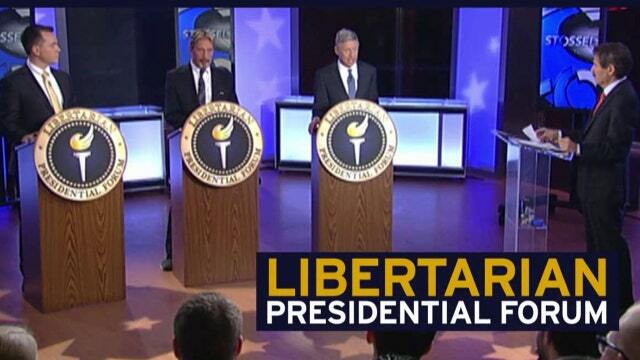 Libertarian presidential candidates Gary Johnson, John McAfee and Austin Petersen discuss the top issues concerning voters in a Libertarian Presidential Forum moderated by FOX Business Network’s John Stossel. While controversies surround the 2016 race for the White House in both America’s Democratic and Republican parties, voters who may not be interested have another option: the Libertarian Party, which promotes civil liberties and free markets. Former Republican Governor of New Mexico Gary Johnson, ‘The Libertarian Republic’ founder Austin Petersen and anti-virus software developer John McAfee are among some of the top names representing the Libertarian Party in the 2016 race. The three joined moderator John Stossel on the FOX Business Network to discuss some of the major issues concerning voters in this year’s race, including the topic of religious liberty and discrimination. John McAfee, another participant in the forum, added his thoughts to the conversation. The Libertarian Presidential Forum will be moderated by John Stossel, and will air in two parts on April 1st and April 8th at 9 PM Eastern Time on the FOX Business Network.